U.S. stock market futures turned higher Wednesday morning, erasing earlier losses, after Portugal successfully raised €1.04 billion in the bond market. Investors who have been concerned over eurozone sovereign debt were relieved the Portuguese auction went well. The Portuguese government on Wednesday sold €661 million ($839 million) of three-year debt and €378 million euros of 10-year bonds, according to Bloomberg. The three-year securities were issued at an average yield of 4.086%, up from an average yield of 3.597% at a previous auction of the same-maturity debt. The auction attracted bids for 1.9 times the amount offered, compared with a bid-to-cover ratio of 2.4 in June. Similarly, the 10-year debt saw an average yield of 5.973%, up from 4.171%, and attracted bids for 2.6 times the amount offered, compared with a bid-to-cover ratio of 1.6 in the March sale. 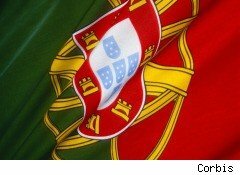 The Portuguese government's ability to sell the debt provided some relief. The Portuguese/German 10-year government bond yield spread narrowed to 365 basis points from the session high of 380 bps. Futures on the Dow Jones Industrial Average were recently up 16 points to 10,354 after trading down 25 points earlier. Given all the recent talk about double-dip recession, weak to stagnant economic growth, eurozone sovereign debt dangers and more, investors seem to be hanging on to every bit of good news.